The holiday season is here and everyone is rushing all about trying to find the perfect gifts for everyone. Happiness tends to drift in the air as lightly and gently as snowflakes and in most cases, continuing to layer only to add to the feelings of the holidays. At least that’s the way we picture it and for most of us it is a happy time of the year ~ but not for all. 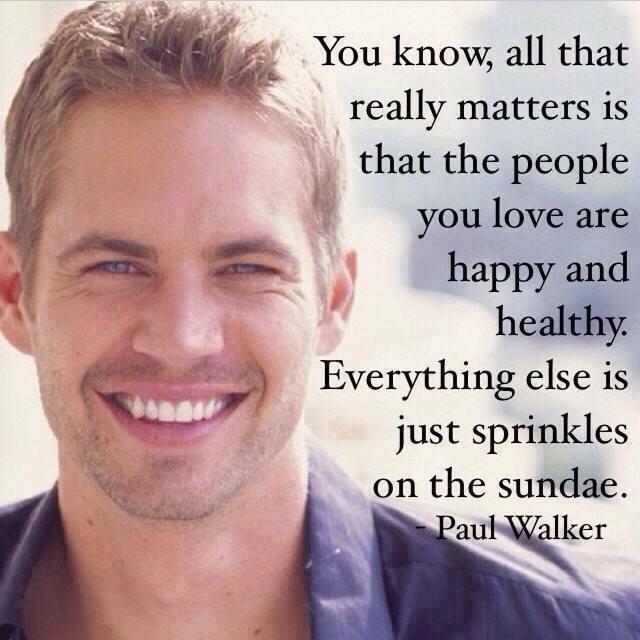 My heart is heavy tonight as I think of the tragic death of Paul Walker and his friend. I intentionally leave it as ‘his friend’ because that is what you will find in the media. The continuous efforts of Paul Walker to give to the needy, especially those victims of natural disasters, shall never be forgotten. His friend ~ even though we haven’t read a lot about his contribution to the world while he was here ~ was just as valuable, we all are. Some people are famous while others are the backbone of what keeps everyone going. Then again, even that can change quickly ~ in one moment. In one moment someone can go from poor to rich (lottery) or from rich to poor. In one moment another death is added to the statistics and another life is brought into this world. In one moment you can say something that slaughters even the hardest of hearts. In another moment you can say something that mends the deepest of wounds. We all go through our lives moment by moment, taking for granted that there will be another; not considering how much of a difference we could be making for someone else. God did not give us another day to live for ourselves; we are given another day to be here for someone else. Do you stay so busy you aren’t having much time to pray or read the Word? If so, you’re busier than God intended you to be. Remember, we celebrate the holiday “Christmas” as the celebration of the birth of Jesus Christ our Lord. Throughout this holiday season try not to rush so much that your moments don’t count. Be a blessing with your actions and your words. Make every moment of your life meaningful. Thank you for making your moments meaningful for others. This is DeVaughn ~ bringing it home.